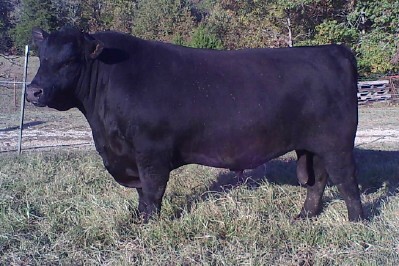 · This Bull has a one of a kind docile personality like his dam (608). She is royally bred combining the growth and personality of WAR alliance with the famous female traits of her Dams sire EXT. · Her adjusted WW: 734 (ratio 117), YW: 960 (ratio 110). Her yearling ultrasound was equally impressive with an adjusted %IMF 5.82 and REA 10.0 far surpassing the average that year IMF of 4.49 and REA 9.72. · She has also qualified as a 2012 Pathfinder proving her superior fertility and mothering traits with her first three calves sporting a BW Ratio of 95 and WW Ratio of 108. Longevity is also an outstanding trait for this bull. His great granddam produced for 18 years calving every year.